Bundi is a city with 104,457 inhabitants (2011) in the Hadoti region of Rajasthan state in northwest India. It is of particular architectural note for its ornate forts, palaces, and stepwell reservoirs known as baoris. It is the administrative headquarters of Bundi District. 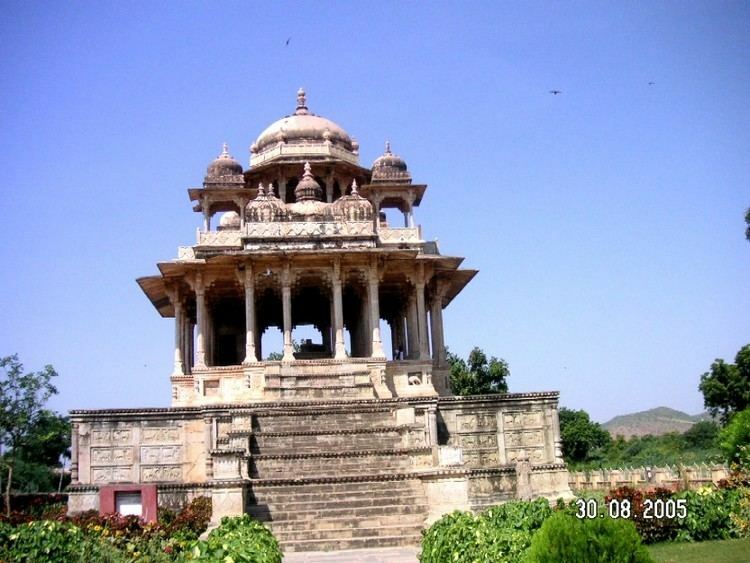 The town of Bundi is situated 35 km from Kota and 210 km from Jaipur. It is located at 25.44°N 75.64°E﻿ / 25.44; 75.64 and an average elevation of 268 metres (879 feet). The city lies near a narrow gorge, and is surrounded on three sides by hills of the Aravalli Range. A substantial wall with four gateways encircles the city. It is served by Bundi railway station on Kota-Chittorgarh rail line. The town of Indragarh and nearby places are famous for the renowned temples of Bijasan Mata and Kamleshwar. The Indargarh step well is considered as one of the most attractive places in the Bundi district, especially during the rainy season. In the 2001 Indian census, Bundi had a population of 88,312. Males constitute 53% of the population and females 47%. Bundi has an average literacy rate of 67%, higher than the national average of 59.5%; with male literacy of 75% and female literacy of 57%. 14% of the population is under 6 years of age. 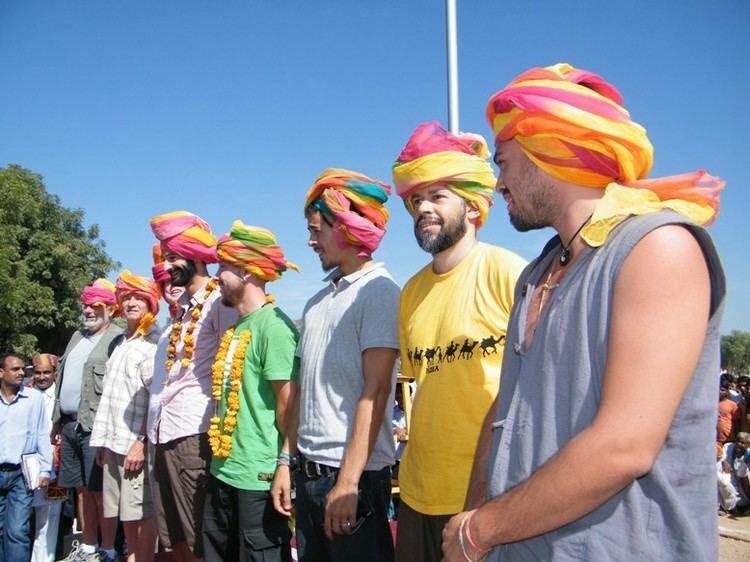 In the 2011 Indian census Bundi has a population of 104,457 people. 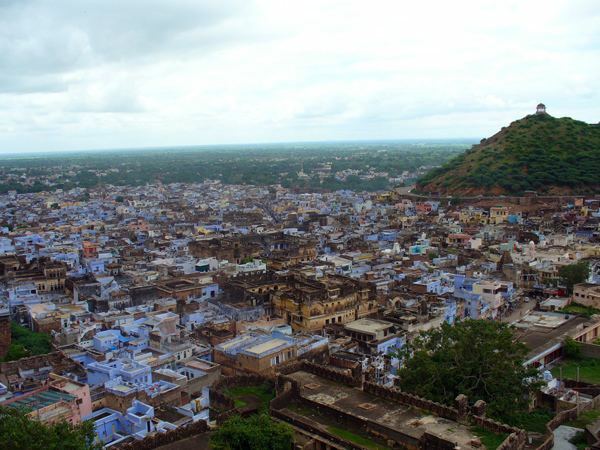 In ancient times, the area around Bundi was apparently inhabited by various local tribes. Bundi and the eponymous princely state are said to derive their names from a former Meena tribe man(Sardar/king) called Bunda Meena. Bundi was previously called "Bunda-Ka-Nal", Nal meaning "narrow ways". Later the region was governed by Rao Deva Hada, who took over Bundi from Jaita Meena in 1342, and established a princely state Bundi, renaming the surrounding area called Hadoti, the land of great Hada Rajputs. The Taragarh Fort, or 'Star Fort' is the most impressive of the city's structures. It was constructed in AD 1354 upon the top of steep hillside overlooking the city. The largest of its battlements is the 16th century bastion known as the Bhim Burj, on which was once mounted a particularly large cannon called Garbh Gunjam, or 'Thunder from the Womb'. The fort is a popular tourist viewpoint of the city below. The fort contains three tanks which never dry up. The technique with which they were built has been long since lost but the tanks survive as a testament to the advanced methods of construction and engineering in medieval India. The largest of Bundi's baoris or stepwells is the intricately carved Raniji ki Baori. Some 46 m deep, it was built in 1699 by Rani Nathavatji. The steps built into the sides of the water-well made water accessible even when at a very low level. The baori is one of the largest examples of its kind in Rajasthan. The Nawal Sagar is a large square-shaped artificial lake in the centre of Bundi containing many small islets. A temple dedicated to Varuna, the vedic god of water, stands half-submerged in the middle of the lake. the lake feeds the numerous bavdis in the old city by creating an artificial water table. The Nagar Sagar twin step wells are identical step wells crafted in pristine masonry on either side of the main spine of Bundi town. The Dabhai Kund also known as the jail kund, is the largest of the kunds in Bundi. Though slightly overgrown, it is well worth a visit for the spectacular carvings on the numerous steps leading down to the water level. The Sukh Mahal is a cream-coloured palace that sits on the water bank. Rudyard Kipling stayed there and claimed that the palace inspired his masterpiece, Kim. There are over 50 stepwells in Bundi, of which only a handful have been maintained. They used to be the only source of water for the town until a piped water system was introduced. After that, these stepwells were abandoned and the monuments fell into disrepair. Most of the former stepwells inside the town have become refuse dumps, and are slipping out of the public consciousness. The Raniji ki Baori is a noted well-maintained stepwell. Murals - Murals in the typical Rajasthani Hadoti miniature style are an important attraction in the Garh Palace. They cover the walls, ceilings and niches in several of the pavilions or "mahals", depicting stories from the life of Lord Krishna as well as scenes from the lives of the royalty. They have significant artistic and decorative values. The Ummed Bhavan "Chitrashala" (also in the Garh Palace, i.e. the palace premises within the Bundi fort)have especially notable murals that are certainly worth a visit. Rock art sites - Rock art sites near and around Bundi are another little-known attraction. Nearly one hundred such sites, some dating back 5000 to 7000 years, have been discovered by a local enthusiast in the sandstone escarpments and caves. These show up the typical line drawings of wild buffalo, deer, tiger, etc. as well as humans in different postures that depict the typical lives and concerns of human beings so many thousands of years ago.